Inhabitat is no stranger to wooden gadgets, but here’s a classic and practical piece that’s getting a similar, cool revamp. 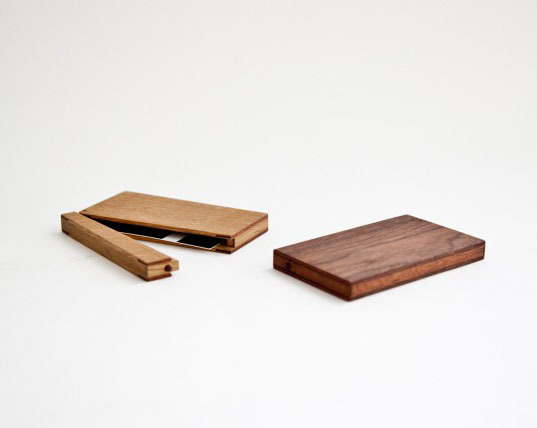 Giving the slick business card a softer look, Masakage Tanno’s wooden cases are beautiful and delicate boxes that have been handmade in Asahikawa, Japan using a thin oak. The boxes are designed exclusively for the Scandinavian shop Mjolk and add a bit of quality craftsmanship to the rigid business world. Handmade in Asahikawa, Japan, these thin oak boxes are designed exclusively for the Scandinavian shop Mjolk. Inhabitat is no stranger to wooden gadgets, but here's a classic and practical piece that's getting a similar, cool revamp. Giving the slick business card a softer look, Masakage Tanno’s wooden cases are beautiful and delicate boxes that have been handmade in Asahikawa, Japan using a thin oak. The boxes are designed exclusively for the Scandinavian shop Mjolk and add a bit of quality craftsmanship to the rigid business world.